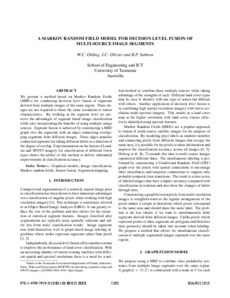 We present a method based on Markov Random Fields (MRFs) for conducting decision level fusion of segments derived from multiple images of the same region. These images do not have to share the same resolution or sensor characteristics. By working at the segment level we preserve the advantages of segment based image classification while also incorporating the benefits of using multiple image sources. This is achieved through including an edge potential that connects overlapping segments from different images and encourages them to share the same label based on their degree of overlap. Experimentation on the fusion of Landsat and SPOT5 imagery indicates that this method can deliver improved accuracy when classifying types of forest.